The Peaceful Mom Weekly Planner 3: Another weekly planner option for you. Click to go to the download page for The Peaceful Mom Weekly Planner 3. 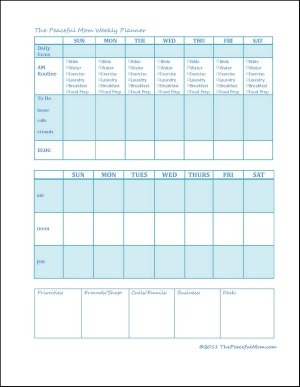 You can see my personal Weekly Planner Sample here. Daily Focus- Choose a daily focus to get more done. For example: Monday-Paperwork, Tuesday-Library/Errands, Wednesday-Grocery List and Meal Planning, Thursday-Grocery Shopping, Friday-Cleaning, Saturday-Family Fun, Sunday-Rest. Morning Routine– A list of personal and household items that need to be taken care of daily. Following a morning routine helps your day get started on the right foot and ensures that you get the daily “do’s” done. To Do- Space to list items that need to be done in a particular day such as specific cleaning chores, phone calls that need to be made, etc. Blank Section-List other important items that need to be done. This is where I list my blogging priorities for the day. Weekly Schedule– Write in appointments or tasks that are time sensitive. Over Flow– Space to list things that need to be done, but don’t have a specific time frame. If you have extra time, check this section. I have also included a shopping list section to write things that need to be purchased. Note: When I receive a bill in the mail, I put the actual bill in the Finance section of my Organization Binder and write the date it needs to be paid in the Desk Section of the planner. 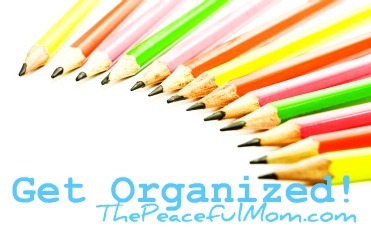 For more printable planners and organization tips, click here! Kimberlee, I NEVER leave comments! But I LOVE what you have done here; I love how your mind works. This is just what I have been looking for. And I love that you have freely shared your talent with us all. May God bless you richly for it–I know He will!